Add visual interest and interactivity to you next eLearning course by using this Quizmaker template. This template is designed to look like papers held onto a corkboard with pushpins. 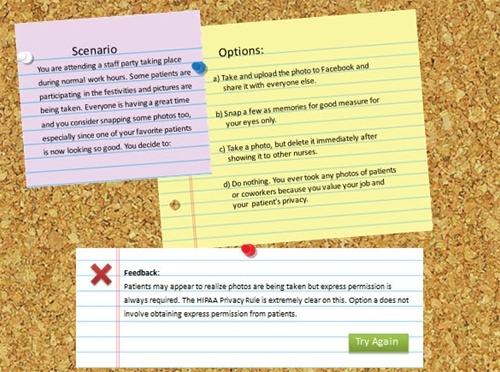 A scenario or intro text can be put on one piece of paper, several options to choose from on a second sheet of paper, and then custom feedback based on the learners choice can be displayed on a sheet of paper below. This Articulate Quizmaker template is also completely flexible. That means that in addition to easily changing the text within the scenario, you can also move the sheets of paper, pushpins, and buttons to your desired location. In minutes, youll be able to whip out an interactive scenario that looks great!